Interests:Attorney, writer, entertainer.<br><br>Great close-up magicians we have known: Shoot Ogawa, Whit Haydn, Bill Malone, David Williamson, Dai Vernon, Michael Skinner, Jay Sankey, Brian Gillis, Eddie Fechter, Simon Lovell, Carl Andrews. J.C. Wagner, one of the great close-up magicians died last night. Also wrote a couple of great books for magicians: The Commercial Magic of J.C. Wagner, and Seven Secrets. Nice guy, creative thinker, great personality, and a real craftsman. 1. LSAT tutor for rent. C. It's the nexus of the crisis and the origin of storms. e: "Maybe God remembered how cute you were as a carrot." I have fond memories of a couple of guys mentioned early. Oscar Peterson taught a master class on computer assisted jazz composition at the U of T despite never graduating High School. How brilliant is THAT! I was at a local club in Ottawa where a wannabe group of kids was performing during bluesfest when Jeff Healy walked in and did a loooong set with them. Very classy act. I heard a radio interview with a guy that backed up Jimmy Buffet who talked about an off night in NYC when they all went to the club where Les Paul played. Jimmy went up to do a number with him and was introduced by Les as "Jimmy from Florida". When he said to Les, I don't have a strap for this guitar Les said, "Don't sweat it, you won't be up here that long". With memories like that these people don't depart until I do. When a deaf person goes to court is it still called a hearing? What is baby oil made of? dont know why i miss her, but i did cry, think she was a friend. Babalu just wanted a shoulder to cry on, is that too much to ask for? My 30's. Haven't died yet but they're terminally ill. Doctors give them 6 months. I will miss them terribly. On Thursday, the day he died I took a chaos theory exam involving some fractal stuff. Larry Evans, 5-time US chess champion. 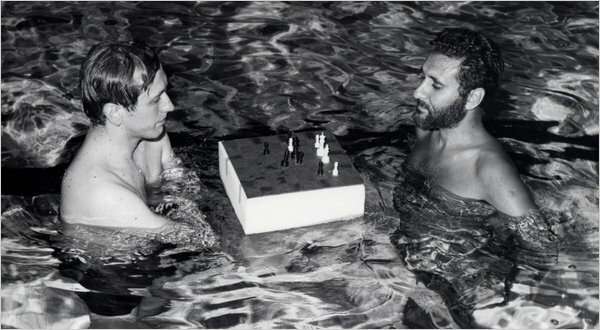 Bobby Fischer, left, training for the world championship with the help of Larry Evans in a hotel pool in the Catskills in 1971.
from the NYT obituary written by Dylan Loeb McClain. I am slowly working my way through My 60 Memorable Games which McClain says Evans "cajoled and exhorted" Fischer to write and which he also edited and wrote introductions for all the games. "Typical of Mr. Evans’s style was the introduction to Game 9 against Edgar Walther, in which Mr. Fischer escaped with a draw: “What makes this game memorable is the demonstration it affords of the way in which a grandmaster redeems himself after having started like a duffer; and how a weaker opponent, after masterfully building a winning." Leslie Nielsen, center, with Julie Haggerty, Peter Graves and, on the floor, Kareem Abdul-Jabbar, in “Airplane!” (1980). Rumack: Well, I don't have anything to say, you've done the best you could. You really have, the best you could. You can't expect to win em all. But, I want to tell you something I've kept to myself through these years. I was in the war myself, medical corps. I was on late duty one night when they brought in a badly wounded pilot from one of the raids. He could barely talk. He looked at me and said, "The odds were against us up there, but we went in anyway, I'm glad the Captain made the right decision." The pilot's name was George Zip. Ted Striker: George Zip said that? Rumack: The last thing he said to me, "Doc," he said, "some time when the crew is up against it, and the breaks are beating the boys, tell them to get out there and give it all they got and win just one for the Zipper. I don't know where I'll be then, Doc," he said, "but I won't smell too good, that's for sure." Ted Striker: Excuse me doc, I got a plane to land. Rumack: Captain, how soon can you land? Captain Oveur: I can't tell. Rumack: You can tell me. I'm a doctor. Captain Oveur: No. I mean I'm just not sure. Rumack: Well, can't you take a guess? Captain Oveur: Well, not for another two hours. Rumack: You can't take a guess for another two hours? Maurice Wilkes, who designed the EDSAC computer in 1949, has passed away aged 96. He was head of the computer lab (or equivalent) at Cambridge University from 1945 until 1980 (the year after I arrived there). Don Van Vliet, who became a rock legend as Captain Beefheart, died today from complications from multiple sclerosis in California. No mention of Blake Edwards? That was Edward Blake. Blake Edwards was an actor, producer and director, and husband of Julie Andrews. May he rest in peace.